LEED v4 - Re-Steel Supply Company, Inc.
As a three generation old family run business that is the parent company of six fabrication facilities and one epoxy coating plant. Re-Steel takes its commitment to the environment very seriously—for our customers, employees and future generations of our business. Re-Steel is an active CRSI member and supporter of the efforts of the U.S. Green Building Council their Leadership in Energy and Environmental Design (LEED) initiative. Re-Steel helps make bridges, highways, major sports stadiums, high-rise buildings, and other large structures studier, safer and more durable. We are also committed to transparent reporting to our environmental impacts and fabricating products that are sustainable. All Re-Steel uncoated fabricated rebar is from on average 98.0% recycled scrap steel (EAF production route) sourced within the United States. Additionally, Re-Steel fabrication scrap is 100% recycled to steel mills. Re-Steel’s products are a major contributor to “Green Construction” and are a positive contributor per the LEED rating system. Re-Steel has completed a manufacturer specific ASTM Certified EPD and is able to supply your project with fabricated rebar that is capable of contributing LEED credit under LEED v4. World class customers such as The World Trade Center, The Mets Stadium, and CHOP Ambulatory Care rely on Re-Steel for the quality and sustainability of our products. Re-Steel commissioned the Athena Sustainable Materials Institute (ASMI) to perform the Life-Cycle Assessment (LCA) that informs the EPD and to produce the EPD Project Report. ASMI’s Research Principal Jamie Meil said, “While we have completed a wide range of EPD projects, this is one of the few occasions that a client insisted that we go upstream to ensure that their environmental profile truly reflected their unique supply chain. 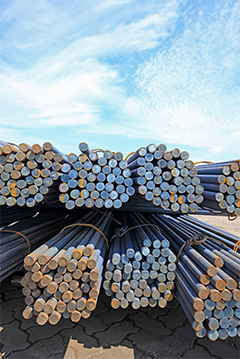 Working with Re-Steel and its major suppliers underscored their commitment to sustainability reporting and given that concrete reinforcing bar is a staple in today’s buildings and infrastructure; we expect that Re-Steel’s EPD will be welcomed by its customers and of cited.